This year we have 4 courses for you to choose from, a 20km ride, 40km ride, 65km ride and a 100km challenge. All courses start and finish at the Singleton Civic Centre in Civic Avenue. Click the links below for maps for each route, including directions and elevation information. When you register, you can choose to pay the registration fees below, or you can fundraise for Singleton Family Support Scheme and ride for free. Once you reach the minimum fundraising target of $200, you won't be required to pay a registration fee. Raffle tickets will be available on the day and when you register online. The raffle will be drawn after the ride. Order an official Mailrun jersey for only $65 when you register online! 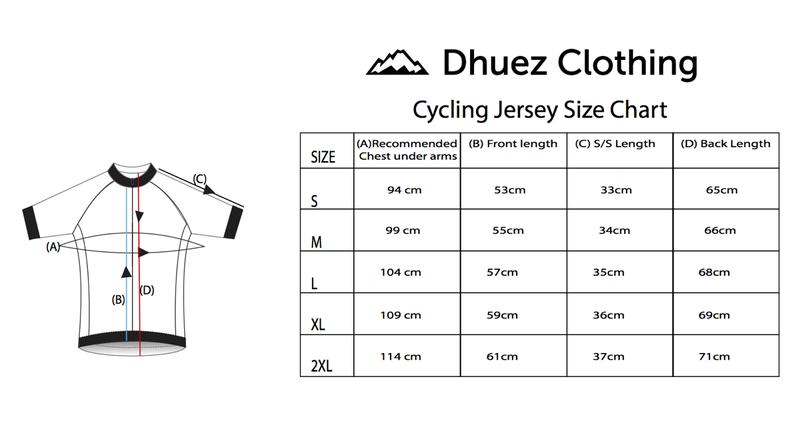 This high quality jersey from Dhuez Clothing is made from CoolPass fabric in relaxed fit with full length zipper and will be available for collection on the day of the ride. It is the decision of the Event Organisers that we do not accept entries for riders under 12 years of age. It is a challenging ride and some children will not be able to complete the course. Young riders are often inexperienced and less confident and are not used to riding in large groups. Children, especially when tired, can ride in an unpredictable manner which may cause accidents, placing themselves, other riders and motorists at risk. We understand that some parents feel that their young children can ride the event comfortably and safely. However, we have to consider the impact this may have on safety in general and on children in particular and adhere to NSW Police and RTA conditions. On the day registrations will be open from 6:30am and riders will be able to set off on the course after the Ride Briefing. ALL RIDERS must go to the registration desk to sign in and pick up your registration bib. This bib entitles you to lunch at the start/finish area and allows you free entry into the Gym & Swim, to utilise their pool, shower and change room facilities. In the interests of safety, riders will be started in groups of 20 or less. The 100km course riders will start their ride between 7am and 7:30. The 65km course riders will start their ride between 7:30 and 8am. The 40km course riders will start their ride between 8am and 8:30. The 20km course riders will start their ride between 8:30 and 9am. As marshals will be closing the course at 1pm, it is requested that all riders complete the course by this time. YMCA Gym & Swim will be open from 9:30am on the day. Stick around after the ride for your free lunch and the drawing of the raffle. Obey the NSW Road Rules and event rules at all times. Ride safely and considerately of other cyclists and road users. Ride no more than 2 abreast at any time unless overtaking. Follow the instruction of any ride official or police officer. Use a hand signal when stopping or to warn of any traffic hazards to any riders following behind. Assist any rider who has been injured or is in difficulty. When an incident has occurred move off the road if possible. Dial 000 (or 112) if there is a serious accident. If there is no mobile phone coverage, the marshals’ vehicles are equipped with two way radio. We will have trained first aid officers covering the event. All marshals will have mobile phone/two way radio contact with first aid. It is the riders own responsibility to be self-sufficient on this ride. However, there will be three water and toilet stops at designated points and a sag wagon to pick up riders with mechanical or other problems. Riders are encouraged to take a break if they think they are fatiguing to the point where they will not be able to ride the full event distance. In the event of mechanical malfunction or flat tyre, pull off the road and attempt to rectify the problem, or seek help from other riders. If the problem cannot be repaired contact a travelling marshal who will arrange transport for you and your bike to the start/finish area. In the event of inclement weather or fog, Police Rules require that participants are not permitted to ride on the road during periods of poor visibility. Participants may only recommence riding once conditions have become safe again. Ride a bicycle in good working order which is suitable for an event of this nature. New NSW road rules stipulate that all cycles should be fitted with a suitable bell. Exercise caution on all public roads and other thoroughfares and ride defensively and courteously. Wear a Standards Australia approved helmet and suitable riding shoes at all times.